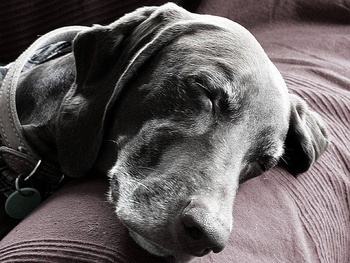 Paw Print Genetics - Let Sleeping Dogs Lie, or Test for Narcolepsy? If I could be a dog for a week, I think I would enjoy sleeping the most. I’ve occasionally found myself jealous of my little terrier mix, snoring away as I wipe the sleep from my eyes in an attempt to get my day started. On his back, with all four legs in the air and dreams of rawhides in his head, he frequently reminds me that life doesn’t always have to be such a rat race. While both dogs and humans tend to share their appreciation for a little “R and R”, there are many conditions where sleep is no longer just a common necessity, but a frustrating burden. Whether it’s an inability to sleep or an inability to stay awake, most people with sleep disorders will attest to the overall decrease in life quality due to their sleep disturbance. One such troubling disorder that we share in common with our dogs is narcolepsy. Narcolepsy is a rare condition marked by excessive daytime sleepiness frequently accompanied by a phenomenon known as cataplexy. Cataplexy is a non-painful recurring condition caused by acute episodes of decreased muscle function leading to a variable clinical presentation from mild muscle weakness to complete collapse. Though it is not possible to know if dogs share other common human symptoms of narcolepsy such as hallucinations upon attempting to sleep or wake up or sleep paralysis upon waking in which sufferers cannot walk or talk, severe cataplexy in dogs is easy to diagnose. Cataplexy is often induced by strong emotional reactions in both species. In dogs, a particularly delicious food, the excitement of running, or a favorite toy are often enough to cause collapse. As a young veterinary assistant, I once witnessed the condition first hand in a miniature poodle that couldn’t stay upright in the exam room after getting a whiff of canned dog food. People that suffer episodes of cataplexy state that they have blurry vision and often have slurred speech, however they are still aware of their surroundings and can hear what is happening. The same is probably true for cataplexy in dogs as dogs will often keep their eyes open after collapse and still seem to be alert despite their inability to move. Most dogs will lie motionless for up to about 20 seconds before getting back on their feet to carry on with their tasks. Though similar in clinical presentations, the cause of the majority of narcolepsy cases may be different between dogs and people. While dogs most commonly develop an inherited form of narcolepsy passed down from their parents, the majority of human narcoleptics appear to be sporadic cases without a family history. Genetic variations in a particular gene called HLA-DQB1, are known to increase the risk of developing human narcolepsy (Lin et al. 1999). Unfortunately, it is not yet understood why variations in this gene lead to disease. Since gene variations in the group of genes to which HLA-DQB1 belongs (the human leukocyte antigen complex) are known to play a role in some autoimmune diseases, it has been hypothesized (though not definitively proven) that at least some cases of narcolepsy in people are secondary to an autoimmune disorder. Evidence supporting this hypothesis was recently published in the journal Science Translational Medicine. Researchers on the study discovered that people in China who were given a particular H1N1 swine flu vaccine containing a specific protein from the swine influenza virus were more likely to develop narcolepsy and also developed an abnormal type of white blood cell that targets and likely destroys certain brain cells containing the hormone hypocretin (also called orexin); these abnormal white blood cells had only previously been found in narcolepsy patients (De la Herran-Arita 2013). Hypocretin is known to be a stimulating hormone with a regulatory effect on arousal and wakefulness. A lack of this hormone in the central nervous system is responsible for the clinical signs seen in the most common form of human narcolepsy which includes cataplexy. Though not all of the details have been worked out, the finding of this type of white blood cell adds strong evidence to the hypothesis that narcolepsy is an autoimmune disease in humans. The Online Medelian Inheritance in Animals website lists 16 dog breeds known to develop narcolepsy. However, the cause of the disease is only known in the Labrador retriever, Doberman pinscher, and the dachshund where 3 different mutations in a gene called HCRTR2 lead to recessively inherited narcolepsy meaning that affected dogs must have two copies of the causal mutation (one copy from each parent) to show signs of disease. Dogs carrying just a single copy of the mutation do not develop the disease, but puppies born to carriers of the same HCRTR2 mutation have a 25% chance of developing the disease. Paw Print Genetics currently offers tests for all three reported variants of the disease. Though the known canine causes of narcolepsy are inherited disorders, we may find that other forms of canine narcolepsy are caused by a combination of environmental and genetic factors as seen in people. Treatments in humans have traditionally involved stimulants from the amphetamine drug class or energizing tricyclic antidepressant medications. Though it is admittedly a bit humorous at times to watch an excited dog have an episode of cataplexy, I can’t help but feel they have a significantly decreased quality of life. Despite their otherwise normal lifespan and health, it is particularly sad that the very objects and activities that bring dogs the most joy are the same things that often trigger a narcoleptic collapse. Since there is no cure for the disease and current drug treatments are tailored for treating the clinical signs of disease and not the root biochemical cause, disease prevention through genetic testing for the causal mutation and selective breeding is the best choice. Dams and sires tested prior to breeding can then be matched appropriately to avoid producing dogs with narcolepsy. While nothing is more adorable than a sleeping dog, sleeping when undesired is damaging to the overall quality of life for both dogs and people. Through modern genetic testing, we now have the opportunity to eliminate narcolepsy from canine bloodlines and allow dogs to enjoy themselves when they sleep, rather than fighting to stay awake.